Cilantro is a versatile herb that is essential in many Mexican, Middle Eastern, Indian, and Asian recipes. It is almost always used fresh because it doesn't dry well. The herb has a unique flavor that some love, but others wish to avoid. You will often find cilantro scattered on top of Indian dishes. It's frequently used in salsa in Mexican cuisine and in Moroccan chermoula and Yemeni zhug. Cilantro is an herb from the fresh leaves of the coriander plant (Coriandrum sativum). This plant is a member of the parsley family, and the herb is also known as Chinese parsley and Mexican parsley. In the U.K. and some other places, you will see cilantro called fresh coriander leaves. The leaves look much like flat-leaf parsley, growing on long, tender stems. The seeds of the plant are used to make coriander spice, which has a completely different flavor from cilantro. The roots of the plant are also edible and used in some dishes. Fresh cilantro tastes pungent, bright, lemony, and a little peppery. To a certain percentage of the population, it tastes soapy. This is due to the natural aldehyde chemical in the leaves, which is also produced during soapmaking and by some insects (including bedbugs). Not all people detect aldehydes in the taste, which can account for the differences in preference for this herb. The flavor is much diminished when the leaves are cooked, and dried cilantro has only a small fraction of the flavor of fresh. Immediately before using cilantro, wash it well to remove dirt and grit. Pick off the leaves and discard the stems. Chop or tear the leaves to the desired size. Add cilantro to the recipe at the end of cooking or as a top dressing. You don't want to cook this herb as it will lose most of its flavor. If you are making pesto or sauce, you can grind the stems as well with a food processor. Practically any savory Indian dish will be finished with a sprinkle of fresh cilantro. It can be included in sauces, salsa, and pesto for use with chicken, fish, tofu, or vegetables. If you don't have cilantro available, the best substitute is culantro, which is even stronger in cilantro flavor. Otherwise, consider replacing it with an equal amount of fresh parsley, tarragon, dill, or a combination of the three. This works best when the cilantro is a top dressing or garnish, but not when it is the main ingredient in pesto or sauce. Dried cilantro will be a poor substitute to fresh, with only a minor amount of cilantro flavor. Look for fresh cilantro sold by the bunch in the produce section of most markets, right next to the parsley. You can find dried cilantro in the spice section. Fresh cilantro should be bright green and the stems should stand up when you hold the bunch in your hand. Cilantro doesn't keep fresh for long. Don't wash it until you are ready to use it or it will degrade swiftly. To keep it fresh for up to a week, place the stems in a glass of water and cover the top loosely with a plastic bag. Keep the cilantro cool by storing it in the refrigerator. Then you can cut off the leaves as needed. You can freeze cilantro if you blanch it first to deactivate the enzymes that will decompose it. 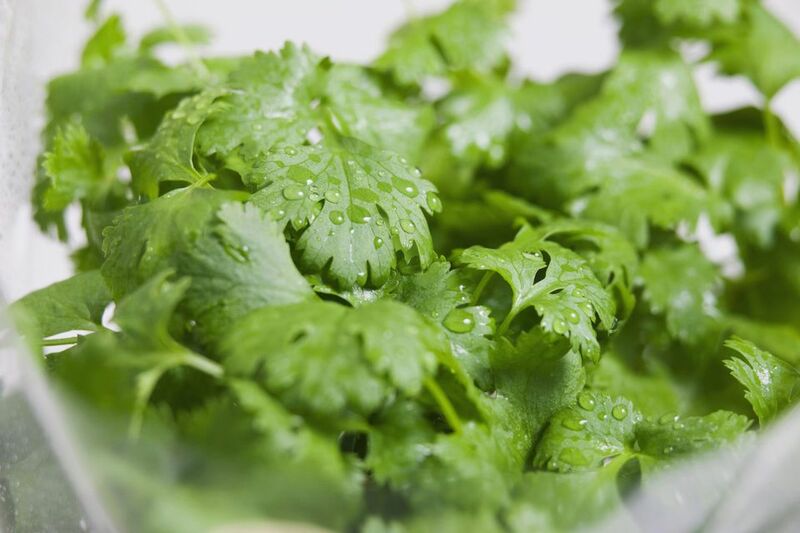 Dip a clean bunch of cilantro into boiling water just until it wilts, then plunge it into a bowl of ice water. Pat the blanched cilantro dry. Strip the leaves off the stems and transfer to freezer bags and freeze. Spread the leaves thinly in the bags and store flat. This will enable you to break off just what you need when you want to use some of a bag of frozen herbs. You can also freeze cilantro oil or pesto to preserve the cilantro flavor. After you've blanched, chilled, and patted your cilantro sprigs dry, coarsely chop them—tender stems and all. Put them in a blender or food processor and puree, adding enough extra-virgin olive oil to make a smooth, somewhat liquid paste. You can also use the blanched leaves to make your favorite pesto recipe before freezing. Pour or spoon your oil or pesto into freezer bags. Put in just enough to cover the surface of the bag when it is horizontal. Freeze flat (horizontal). What you'll end up with is a pesto "pancake" from which you can break off just what you need. Alternatively, fill ice cube trays with your cilantro oil or pesto. Freeze, then pop out the cubes and transfer them to freezer containers (or freezer bags). Each cube will be approximately 1 tablespoon of herbal oil or pesto. Instead of freezing, make cilantro compound butter. Use 1/4 cup of finely chopped fresh cilantro leaves in a basic herb butter recipe. Cilantro salt is another way to keep cilantro flavor handy for use. Finely chop a bunch of fresh cilantro. Include the stems and take some help from the food processor to mince them. Measure the chopped cilantro by loosely packing it into a measuring cup. For every four parts fresh, chopped cilantro (by volume), add one part kosher or other coarse, non-iodized salt. Mix well and store in tightly covered glass jars in the refrigerator for up to one year. Use anywhere cilantro flavor is welcome, leaving out any other salt called for in the recipe. Fresh leaf cilantro is very low in calories and has important vitamins. One half cup has only 2 calories and provides 28 percent of the daily value for vitamin K (essential for strong bones and teeth) and 3 percent of the daily value for vitamins A and C. Like most leafy greens, it has strong antioxidant activity. Studies have been looking into its ability to detoxify heavy metals such as lead and mercury in rodents. Cilantro also has a chemical compound that has shown antimicrobial activity in lab experiments. This herb has traditionally been ascribed a calming and sleep-promoting effect, and some animal studies have found a sedative effect for coriander oil extracts.